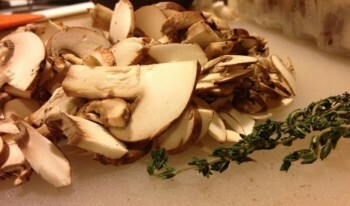 Download PDF Pumpkin, thyme, rosemary and mushrooms make this a really wonderful, earthy dish. I use this recipe a lot to entertain. In fact, I used it for my first dinner party of 2012 along with my Orange-Thyme Honey-Mustard Pork Loin and roasted Brussels Sprouts. I give the relative timing for making everything come out at the same time at the Pork Loin recipe so you can do the same thing knowing that it’s all going to workout in the end! In a saucepan, heat the wine and stock, along with the garlic, rosemary and thyme sprig, just to a simmer. Heat 1 tbsp butter and 1 tbsp olive oil in a heavy skillet over medium heat. Add the mushrooms. Season with salt (to aid in drying them out) and pepper. Saute, stirring occasionally, until they are thoroughly cooked and beginning to caramelize. Stir in the balsamic vinegar and allow to reduce. Turn off the heat. In a separate sauce pan, heat 2 tablespoons olive oil over medium heat. Add the onion and sauté until translucent, about 2-3 minutes. Add the rice and sauté, stirring constantly, until the rice is opaque (it takes on a chalky white color instead of the smoother ivory of raw rice), about 1 minute. Reduce the heat to low. Ladle about 1 cup of the hot stock mixture to the rice and stir. Turn on the radio and settle in at your stove. Stirring every minute or so, allow the liquid to be absorbed by the rice and then ladle in another ½ to ¾ cup of the liquid. Repeat until all the liquid has been added. Along with the last ladle of liquid, add the pumpkin purée and continue to stir. Cook for 3-4 minutes more, until the liquid is again absorbed. Remove from the heat and stir in 1 tablespoon butter and the parmesan cheese. The whole dish should transform into a smooth, rich consistency that should be JUST thin enough to pour or ladle. If it begins to get too thick, add a little water to thin it. If you’re using fresh thyme, stir in the final 1 tsp thyme leaves. Season with salt and pepper to taste. Reheat the mushrooms for a minute or two. 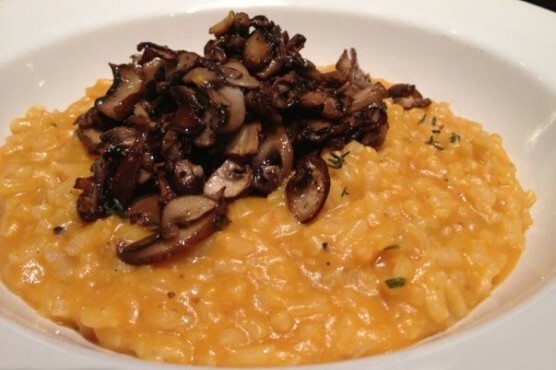 Serve the risotto in bowls topped with some of the mushrooms. This is great alone, or a great accompaniment to a simple rotisserie chicken and salad. Oh, and isn’t there still nearly a whole bottle of wine sitting around somewhere?